The rumor mill has been abuzz with the rumor of Dean Ambrose leaving WWE after WrestleMania 35. The WWE Universe has divided opinions on this rumor, as some members (including me) say it is a work or it is WWE’s way to troll All Elite Wrestling, while some fans believe this rumor to be true, given the way WWE Creative has booked Dean Ambrose’s on-screen character as of late. 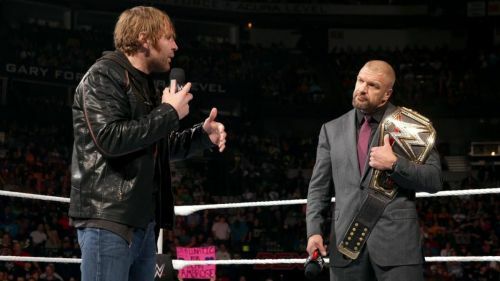 Only Dean Ambrose and the WWE officials know the Lunatic Fringe’s status with the company. But irrespective of his future, he will stay with WWE until the company’s grandest PPV, WrestleMania. 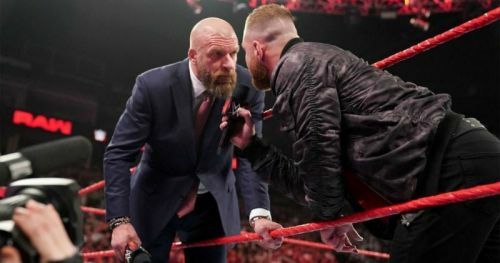 WWE could try to give Dean Ambrose a perfect send-off at WrestleMania and the best way WWE can book him at the Grandest Stage of Them All (irrespective of his future) would be a match against Triple H.
Here are the 7 reasons this match should take place. Triple H has of late put over new and upcoming superstars of the company at WrestleMania. The Game put over Daniel Bryan at WrestleMania 30 (singles match), Roman Reigns at WrestleMania 32 (WWE World Heavyweight Championship match), Seth Rollins at WrestleMania 33 (Non-Sanctioned match) and Ronda Rousey at WrestleMania 34 (Mixed tag team match also involving Kurt Angle and Stephanie McMahon). All the above superstars achieved enormous success in the WWE and if Vince McMahon wants Dean Ambrose to stay with WWE after WrestleMania 35, then this should be the match that Ambrose should wrestle in at WrestleMania 35. A match against Triple H will draw major attention towards the Lunatic Fringe, which he wants the most.